Fully Custom QR Codes from WNY Print! We are pleased to introduce a new design service from WNY Print. We can now fully customize your standard QR code and integrate colors, logos and more into them so you can deliver an eye catching, truly unique promotion to your customers! Adding color to your QR Codes is our most standard custom feature. We can integrate single, multiple or gradient colors into your QR code and create a bright and exciting promotion for you. Note: There are very little limitations with this feature. We can transform the standard box shaped data anchors in your QR code to give it that little bit of extra personality. We can change the anchors by adding colors, shapes, symbols and solid logos. There are certain limitations to this feature but we will do our best to accommodate your ideas. TECH SAVVY MARKETING FOR YOUR COMPANY IN A TECH SAVVY WORLD! Although WNY Print can only change the shape of your QR code in a very limited capacity, we can try and adapt your code with a whole new look.. This custom feature from WNY Print can only be used very subtly without changing the functionality of your code. We will do our very best to implement your great ideas into your custom QR Code from WNY Print! Get rid of those boring black squares that make up your QR Code. WNY Print can manipulate your code to a certain extent and integrate different shapes and logos into it. This feature also has a very limited capacity but as you can see from samples above, we can go above and beyond by manipulating the standard code. As always, we'll do the very best we can to make your custom QR Code as creative and eye cathing as possible! 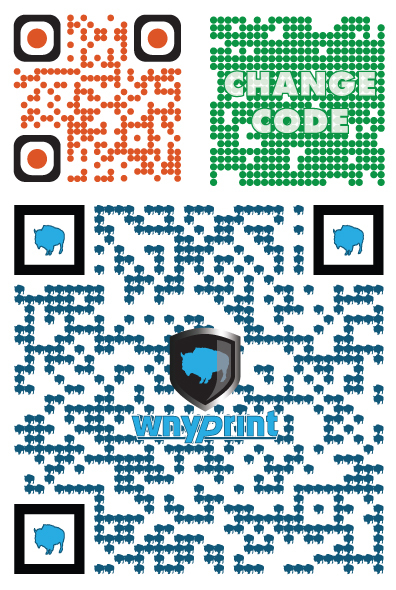 WNY Print can do a lot of amazing things to make your custom QR Code as unique and creative as possible. If an instance should arise and we are not able to implement your ideas into a custom QR code for you, we have our "add into images" option that will allow us to add your QR code into another image. Even if your code can not work with some of our other features, we are confident that we can still create a fully custom, eye catching code for your next promotion! Note: There are very little to no restrictions with the "add into images" feature. WE'LL MAKE IT TOTALLY ORIGINAL! 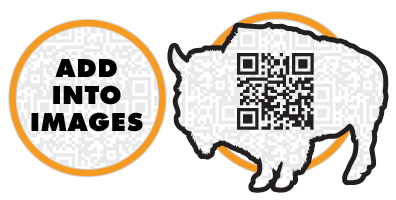 WNY Print has the ability to add background images into your custom QR code. We can add photographs, silhouettes, logos, shapes, patterns and more to give your QR code a fully custom look. CURIOSTY TO SCAN IT WILL GET YOU POTENTIAL NEW CLIENTS! Who says QR Codes need to be square? WNY Print can manipulate your code and transform it into any shape! Add images, borders or dead code around the perimeter of your code to truly customize your QR Code to the fullest extent. Note: There are certain limitations we could run into when creatiing your QR code with this feature. ADDING YOUR LOGO WILL CREATE A BUZZ AND GET CONSUMERS EXCITED ABOUT WHAT YOU HAVE TO OFFER BEFORE THEY EVEN SCAN IT! Get your customers excited before they even scan your code. Addinng your logo right into your QR code will create a buzz and let your customers know you have some information you need to give them. Whether it's to let consumers know about a promotion, contest, coupon etc. or you just want to relay some information to them, getting them excited about scanning your code in the first place is the most important part of any QR Code marketing campaign. 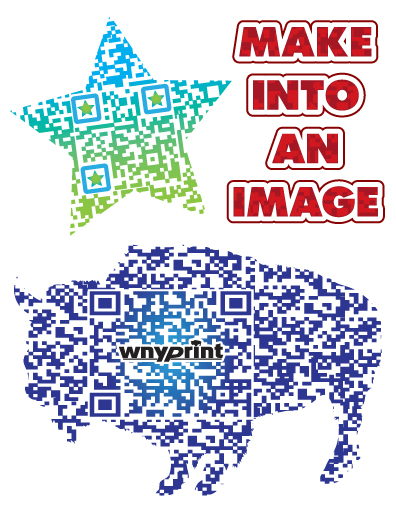 Custom QR Codes from WNY Print will help you get noticed and most important.... GET SCANNED! Custom QR Codes from WNY Print are fully customized pieces of artwork that are designed and created solely from your specifications. With the nature of these QR codes being met with your criteria, there is no standard pricing guide. Contact us today for a cost effective quote!